1692: first record; Saburôzaemon's rank in the Kyôto hyôbanki, tachiyaku section, was naka-no-jô (superior in the middle class). 7th lunar month of 1692: Saburôzaemon performed as a tachiyaku in Kyôto in the drama "Kashima no Kanameishi", which was produced by Yamashita Hanzaemon I. 11th lunar month of 1693: Saburôzaemon performed as a tachiyaku in Kyôto at Miyako Mandayû in Tominaga Heibei's drama "Budô no Tassha", which was produced by Osagawa Jûemon; his stage partners are Shibazaki Rinzaemon I, Sakurayama Rinnosuke I, Kirinami Senju I, Sodesaki Karyû, Sugiyama Kanzaemon I and Sendai Yagoshichi. 1st lunar month of 1702: Saburôzaemon played in Kyôto the role of Hayami Jinnojô in the ni-no-kawari drama "Yome Kagami", which was produced by Matsumoto Nazaemon III. 1st lunar month of 1706: Saburôzaemon became sakusha and worked in Kyôto at Hayagumo Chôdayû's theater on the kaomise drama "Saiwai Gura Muneage no Tsuchi", which was produced by Takeshima Kôjûrô. 11th lunar month of 1706: Saburôzaemon worked in Kyôto at Hayagumo Chôdayû's theater on the kaomise drama "Sukeroku Shinjû Kamiko Sugata", which was produced by Takeshima Kôjûrô. 2nd lunar month of 1707: Saburôzaemon worked in the same theater on the drama "Keisei Ishiyamadera". 11th lunar month of 1707: Saburôzaemon worked in Kyôto at Hayagumo Chôdayû's theater on the kaomise drama "Ohiyaki Sannin Musume". 11th lunar month of 1710: Saburôzaemon performed as an oyajigata at Hoteiya Umenojô's theater in the kaomise drama "Tagasode Ume Sakura Matsu". 2nd lunar month of 1711: Saburôzaemon worked in the same theater on the drama "Biwa no Umi Futatsu Gashira". 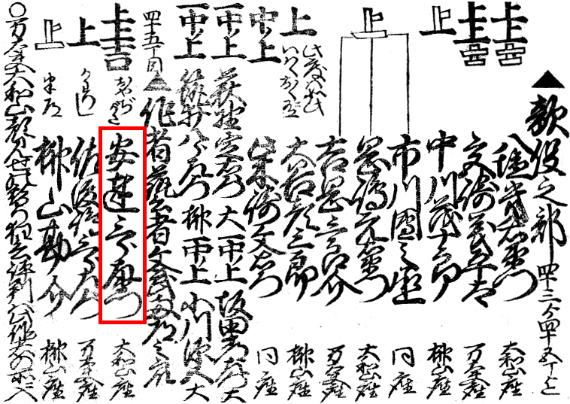 3rd lunar month of 1711: Saburôzaemon's rank in the Kyôto hyôbanki, oyajigata section, was jô-jô (superior - superior) [visual]. 11th lunar month of 1715: Saburôzaemon worked in Kyôto at Hoteiya Umenojô's theater on the kaomise drama "Manpô Chitose no Matsu", which was produced by Yamatoya Jinbê III and included a kôjô commemorating the sudden death of the star Kataoka Nizaemon I. 1st lunar month of 1716: Saburôzaemon worked in the same theater on the new year ni-no-kawari drama "Keisei Otokoyama". 11th lunar month of 1716: Saburôzaemon worked in Kyôto at Hayagumo Chôdayû's theater on the kaomise drama "Tatsu no Miyako Ikuyo no Yonedawara", which was produced by Yamatoyama Jinzaemon I. 11th lunar month of 1717: Saburôzaemon worked in Kyôto at Ebisuya Kichirôbê's theater on the kaomise drama "Genjôraku Biwa no Ôumi", which was produced by Yamatoyama Jinzaemon I. 11th lunar month of 1718: Saburôzaemon worked in Kyôto at Ebisuya Kichirôbê's theater on the kaomise drama "Shiga no Miyako Kogane no Hanazono", which was produced by Yamatoyama Jinzaemon I. 12th lunar month of 1719: Saburôzaemon worked in Kyôto at Ebisuya Kichirôbê's theater on the kaomise drama kaomise drama "Yamato Ôji Meoto Izumi", which was produced by Sawamura Chôjûrô I. 1st lunar month of 1720: Saburôzaemon's rank in the Kyôto hyôbanki, sakusha/oyajigata section, was jô-jô-kichi (superior - superior - excellent) [visual]. No record afterwards. Adachi Saburôzaemon  was both an actor and a sakusha. He spent all his career in Kyôto, starting as a tachiyaku and ending as an oyajigata. Recorded as Adachi Saburôemon instead of Adachi Saburôzaemon in Nojima Jusaburô's book "Kabuki Jinmei Jiten".